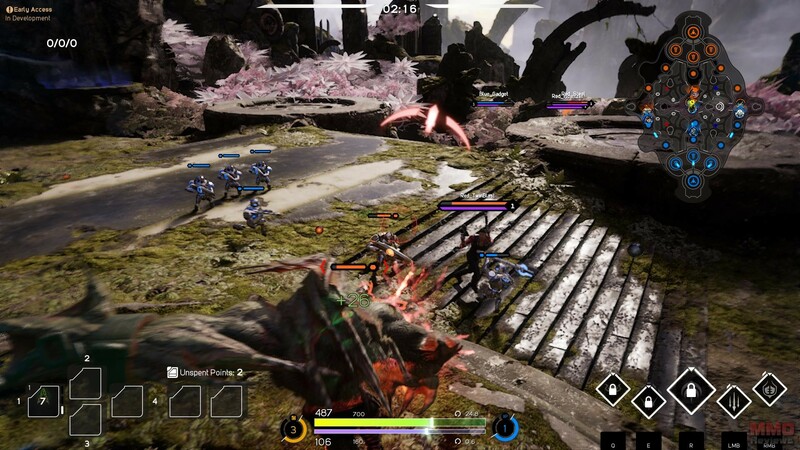 A fantasy-scifi MOBA Paragon ticks the boxes for a more traditional style game with gameplay many fans of the genre will find familiar; multiple heroes that work together in a team of 5 against a similarly matched team with an ultimate objective of destroying the enemy core. The third person perspective bridges the gap between shooter (with much shorter ranges on ranged attacks) and MOBA using classic mechanics with health and mana pools, multiple attacks and in-match upgrading. There are thirteen heroes available in the game, with more to be continuously added as the game goes on every three weeks, ranging from support, melee tanks, junglers and more, the wide array of characters with their own unique attacks offers up a variety of playstyles. Skills are bound to the QER keys as well as left mouse key for your free basic attack and right mouse key; players will gain XP for killing enemies and destroying structures which allows them to level up and unlock new skills or upgrade existing ones. There is a single map in the game right now known as Agora which consists of three lanes separated with jungle areas, these link the two opposing team bases that hold the teams’ core; the objective is simple: push through to the enemy base and destroy their core to win the game. Each lane has two enemy and to allied towers that will attack all enemies that come within range, to get close enough to destroy these towers players will have to help push their constantly spawning waves of minions down the lane to soak tower damage whilst they themselves destroy it. Doing this isn’t such an easy task as the opposing team’s heroes are also trying to do the same thing! The maps offer verticality unseen in other true MOBA to such an extent, players can head up onto high raised platforms, bridges and rocky outcrops, or down into the lower depths of the jungle area; this shooter style combat offers a completely unique style of gameplay for the MOBA genre. Separating the lanes is the shadowy jungle areas; within players will find a variety of camps that can offer them various benefits. Some camps are protected by NPCs who, once killed, will drop a coloured orb that grants an attack speed, damage or mana regen buff for two minutes; if the player is killed they drop their orb and their opponent is able to use it with the timer being refreshed. Other main camps are harvesters that players can activate whilst standing on a point, after thirty seconds these harvesters will start to accumulate CXP (Card XP) that once taken from the harvester grants it to all players on the team; however, if an enemy team destroys the harvester before the activating team empties it then they will get a portion of the CXP instead. Card XP allows players to activate cards, that are used as passive buffs and multi-use items such as heals and mana regen, earn enough CXP and you earn a Card Point, each card has a different card point cost and players can have a maximum of six at any time, but are able to replace their cards. Cards are earned through gameplay allowing players to build up their own decks that suit their playstyle and strategy in game.